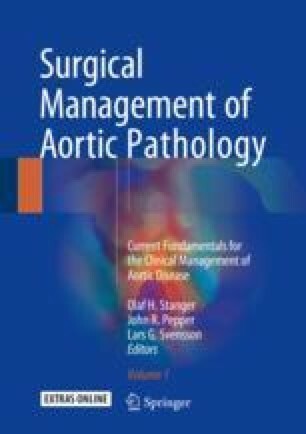 There are two main treatment strategies for advanced aortic arch pathology: traditional surgical replacement and hybrid repair. Regardless of the treatment strategy, cerebral protection is of paramount importance to minimize morbidity and mortality. As result, numerous cerebral protection strategies have been utilized including hypothermia and cerebral perfusion which have rendered aortic arch interventions safe. Traditional open arch replacement represents the gold standard by which all other aortic arch interventions should be measured as it has been shown to be safe and effective. Recently, hybrid arch procedures have been developed which incorporate both open surgical replacement and thoracic aortic endograft repair. While effective with specific anatomy and patient populations, hybrid arch repair in its current state has not supplanted open surgical repair in the general population.